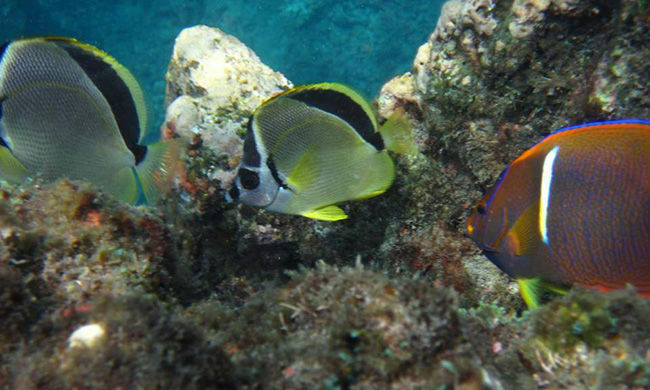 Enjoy a Day Full of Fun while Snorkeling One of the Best Spots in Costa Rica. This tour takes you on an early morning boat ride for a full day of fun to Caño Island Biological Reserve and a visit to Violines Island. The boat ride is part of the adventure: the 1.5 hour trip is a great opportunity for dolphin and whale watching, as you see spotted and bottlenose dolphins, humpback whales (depending on the season), large sea turtles, and even flying fish. The boat is run by a three-man team, is in great shape, and even has shade. Your captain can stop to let you observe and take photos of the wildlife. Your first stop will be at Caño Island for some of the best snorkeling in Costa Rica. Next, take a 30-minute ride to Violines Island. You’ll enjoy a picnic lunch on this small island, where you can spend the rest of the time exploring the beach and/or swimming. During dry season, you can typically snorkel in the reefs. In the afternoon, you will start heading back to Uvita and will be able to spot the largest mangrove forest protected in Central America—Térraba National Park. This tour is ideal for those who enjoy long scenic boat rides and appreciate marine life. Note: there are no restrooms available until Violines Island. The time that you spend on Violines depends on the amount of time you spend snorkeling at Caño Island. Your tour includes: boat transportation from/to Uvita, bilingual guide, snorkel equipment, park entrance fees, picnic lunch, water. Be at the dock 30 minutes prior to scheduled departure! What to bring: camera, sunscreen, insect repellent, sunglasses, hat, towel, change of clothes. Wear a swimsuit, shoes with grip (for the boat), shirt to cover shoulders while snorkeling.